Was it courageous or foolhardy? Perhaps born of euphoria sweeping the country as recent victors at the Battle of Waterloo. Perhaps just the naïve optimism of youth. 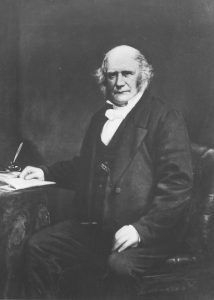 Either way, we find a 23 year old William Gebbie arriving in Strathaven in September 1816 to set up his own law firm here. Never lacking in confidence, the young Mr Gebbie would have expected his business to succeed. It may have surprised even him, however, to learn that, as Gebbie & Wilson, the firm which he founded in 1816 would still be practising, still thriving, still in Strathaven now, 201 years later, in 2017. As Strathaven’s Solicitors for all of these 200 years, Gebbie & Wilson’s story is a remarkable one. 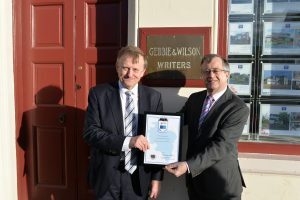 Not only Strathaven’s longest established business, Gebbie & Wilson is also one of Scotland’s oldest law firms – always in Strathaven, never having amalgamated or been taken over and tracing its unbroken lineage of only 14 partners from William Gebbie in 1816 to David Murray and Russell Paterson in 2017. Our team at Gebbie & Wilson now comprises 6 Solicitors and a support staff of 14. 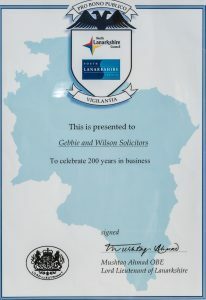 Last year, we were honoured to receive formal recognition our firm’s impressive achievement in attaining its bicentenary. This came in the form of a scroll, presented by Margaret Morton, Depute Lord Lieutenant of Lanarkshire, on behalf of South Lanarkshire Council. “It is most unusual for such an accolade to be bestowed” commented Margaret “but both the Council and the Lord Lieutenant were keen to mark this significant milestone in the life of the Strathaven community”.